On Saturday morning we woke up to gorgeous weather perfect to walk in. We put on our purple shirts, and we met up with friends old and new. And then we marched, led (of course) by Maddie’s sister. After, we gathered and exclaimed over how much Maddie’s friends had grown. And we welcomed all of the new friends. We did it for Annie. And we do it so someday, we can stop walking. all photos by Megan Hook Photography. Seriously! Your kids are stinkin’ cute!!! This brought tears to my eyes. Thank you for doing what you do. Gorgeous photos.. my absolute FAVE is the first one of proud, determined Annabel leading the charge. From a former preemie, thank you. I am honored to have walked with your family. Thank you for welcoming me. Also, this is a video of a pregnant mom flash mob that benefits the march of dimes. For every youtube viewing of this video a dime will be donated to the march of dimes. http://youtu.be/JBIOzyOT1gI Wanted to share since you'd be able to spread the word more effectively with your blog/twitter than I could. Wow! Loved that video!!! So sweet, and for a great cause!!!! Thanks for posting! It is impossible to tell me that there exists a cuter picture in the world than that picture of Annie marching and leading the way. Annie looks lovely! I’m glad you had such beautiful weather. OMG, I love the one of Annie marching. She looks so determined — love the tongue out! The picture of Annie marching is priceless. You’re sure going to miss Annabel when I eat her up! Sorry, but I won’t be able to help myself after seeing that determined march photo! Heather, I rarely cry when I read blogs, but that picture of Annie and the caption brought tears to my eyes (in Starbucks!). So sweet. I just LOVE, LOVE, LOVE the picture of Annie walking!!! So proud of all the hard work you guys put into the March for Babies. While waiting for our Maddie t-shirts, we wore purple in honour of Maddie while on our walk. As ALWAYS…missing, loving and hurting so badly Maddie didn’t get to walk with you all. How unfair it is she isn’t here in person however, I do believe with my whole heart & soul….she was certainly there in spirit!! My little team of 10 seems so small now. You guys are awesome! Thought of all of you as we marched on Saturday too, especially sweet Maddie! Absolutely GORGEOUS photos. My favorite has to be Annie leading the march. She looks so stinking cute. But then again she always looks so stinking cute! That purple tutu is the cutest! Wish I could pull off wearing an outfit like that! Oh. My. Goodness. That picture of Annie is perhaps the cutest thing I’ve ever seen. You guys sure reproduce well. So honored to have been a part of your team. Must not weep at work!!! That photo of Annie leading the way made me well up bigtime. LOVE the pictures of Annie! So wish we could have been there in person; but we’ll be walking for Maddie here on May 14th! Oh my goodness, the photo of Annie marching in that tutu… are you trying to torture me with the cuteness? Love it! Glad it went well, I was thinking of you guys. Love the pic of Annie leading the pack! Another successful March under your belts! Way to go Team Maddie! Oh my gosh, I looove that first picture of Annie! So darn cute Glad you had a beautiful day for the March!! Love the Annie pic! It’s my favorite. And the tutu’s. LOVE the picture of Annie marching. Looks like I’m not the only one. Oh that picture of Annie marching is priceless!! Look at Annie marching out in her purple tutu for her big sister. What an amazing thing you all do. Love the picture of Annie marching. What a keeper that is! Looks like you had a beautiful day for the walk. I was with you in spirit from over here in Australia. Next year I’ll be back to walking for Maddie. OMG, I adore that picture of Annie marching. Too perfect…absolute cuteness backed by a will of steel. That first picture of Annie leading the charge is so good it should be in a contest for beautiful babies. Seriously! Love the purple skirt. Bless your family for still doing the walk for babies in Maddie’s name. Love the purple tutu and the tongue sticking out. Such determination!! I have the feeling your going to have some trouble in your future with a stubborn little girl. Glad the walk went well. I love the picture of Annie marching. She is so determined. In the spirit of the March of Dimes, Kings Island in Cincinnati and Becoming mom held a casting call for pregnant moms to come to KI and participate in a flash mob. For each click on the page Becoming Mom will donate $.10 to the March of Dimes. Thought you might like this..
Heather, you are awesome! I am so proud of your ability to change what has to be the most horrific event of your life into something so moving and so helpful to people all across the world! I know you want your Maddie back more than anyone in this world could imagine…I am so proud of your for channeling your energy into such worthy projects and keeping Maddie’s name such an honorable legacy! 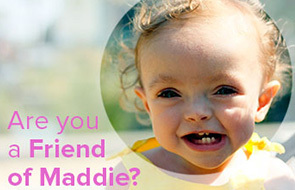 I don’t know of many babies that complete strangers could recognize by face but I assure Maddie’s face is recognized by millions because of your determination! P.S. Annie is soooooooooooo stinking cute! How do you not gnaw on those thighs????? I absolutely LOVE the picture of Annie wearing that tutu and marching for her big sis! These are fantastic and inspiring photos! Your Annie could not be any cuter! Your girls look so different from each other and each is exquisitely beautiful. Maddie’s eyes, her sweet smile, and her story continue to move me as do your posts and pics about Annie. Love the pictures, love the March of Dimes, love Maddie, love Annie, love YOU! i don’t post often but i read faithfully. how wonderful to have so much love and support around you. that picture of Annie proudly marching for Maddie is just darling. people like you are one in a million. Heather, I think you and Mike are amazing people – to be able to focus on the work that needs to be done and not on your extraordinary and unfair loss is really something phenomenal. I know you didn’t want to be an example of grace and love, and you’d rather have your Maddie in your arms, but at least if your family had to go through this you still manage to spread joy and love and kindness and responsibility through a world gone mad. You and your daughter really have changed the world, by getting into people’s hearts and growing their love for others. The kids are really vibrant, what a great Saturday you had! The picture are really adorable and made my day, thank you so much for sharing it. Absolutely amazing!!! Annie is leading the way with such determination, such a great little sister she is!!! I work in a NICU and this is my 2nd year doing the walk. However, this is the 1st time my kids, ages 7 and 9, did the walk. They understand “NICU” and “preemies” but to help them understand more, I showed them your video you posted last week. Thank you for posting it. It really helped them understand and put a face to the walk. We walked for all the preemies in my NICU but we also walked for Maddie. It’s hardly original but I have to chime in too and say that picture of Annie leading the march for her sister is absolutely adorable. Hugs to you and all your team.